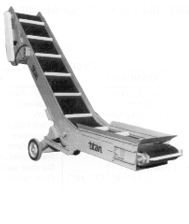 TITAN Industries | Conveyors | Innovative Oil Storage Systems Products | The Bernard Company, Milford CT.
Titan Industries offers a full line of pre-engineered and custom conveyors as well as specialty equipment designed as allied components to the conveyor line. Titan provides customers with detailed approval drawings. Once orders are placed, they manage and track them using the newest software capabilities. Their plant in New London, Wis., is conveniently located in one of the upper Midwest’s most vibrant manufacturing centers. 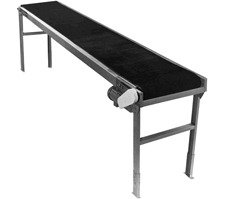 That puts them within a 24-hour shipment radius of virtually all components they need for custom and pre-engineered conveyor products. 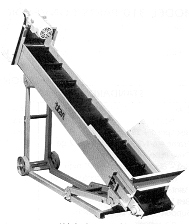 Titan Industries produces a broad line of custom conveyors used in scrap metal, packing, bulk handling, automotive, plastics, durable goods, food, recycling and other applications. 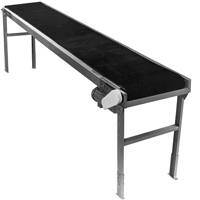 Conveyor Frame- Formed 12 ga.
Conveyor Frame- Formed 10 ga.
Conveyor Belt- 2-1/2" pitch x 4"-6"-8"-12"-18"-24"-36"-42"-48"
Conveyor Belt- 4" pitch , 10 ga. apron widths 6" to 20"
Conveyor Speed- 30 fpm Profile- 25" with 8 tooth 15.86" pitch dia. 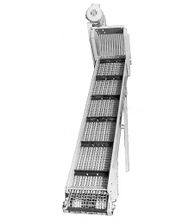 Conveyor Frame- Formed 7 ga.
Conveyor Profile- 21" with 8 tooth 12" pitch dia.